The neuroanatomical basis of autism spectrum disorder (ASD) has remained elusive, mostly owing to high biological and clinical heterogeneity among diagnosed individuals. Despite considerable effort toward understanding ASD using neuroimaging biomarkers, heterogeneity remains a barrier, partly because studies mostly employ case-control approaches, which assume that the clinical group is homogeneous. 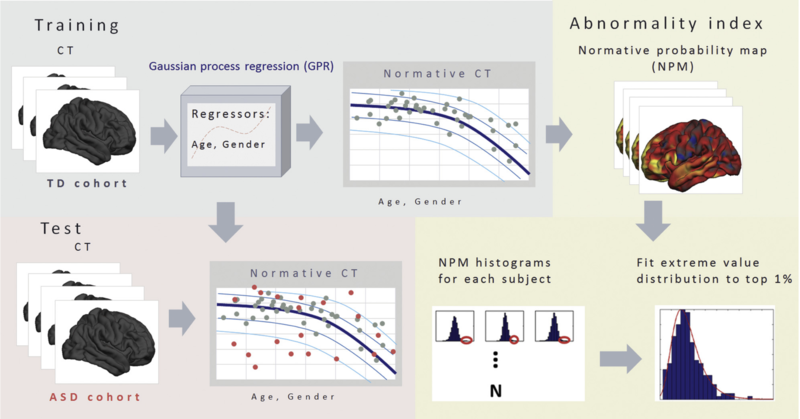 Here, we used an innovative normative modeling approach to parse biological heterogeneity in ASD. We aimed to dissect the neuroanatomy of ASD by mapping the deviations from a typical pattern of neuroanatomical development at the level of the individual and to show the necessity to look beyond the case-control paradigm to understand the neurobiology of ASD. We first estimated a vertexwise normative model of cortical thickness development using Gaussian process regression, then mapped the deviation of each participant from the typical pattern. For this, we employed a heterogeneous cross-sectional sample of 206 typically developing individuals (127 males) and 321 individuals with ASD (232 males) (6–31 years of age). We found few case-control differences, but the ASD cohort showed highly individualized patterns of deviations in cortical thickness that were widespread across the brain. These deviations correlated with severity of repetitive behaviors and social communicative symptoms, although only repetitive behaviors survived corrections for multiple testing. Our results 1) reinforce the notion that individuals with ASD show distinct, highly individualized trajectories of brain development and 2) show that by focusing on common effects (i.e., the “average ASD participant”), the case-control approach disguises considerable interindividual variation crucial for precision medicine.